There has been much rumination about the design on a house in rural Fennimore county, out near Fahnstock on a dead end road interrupted by a creek whose name I forget. Milton created that landscape. But the inspiration for what might be there comes from a movie. 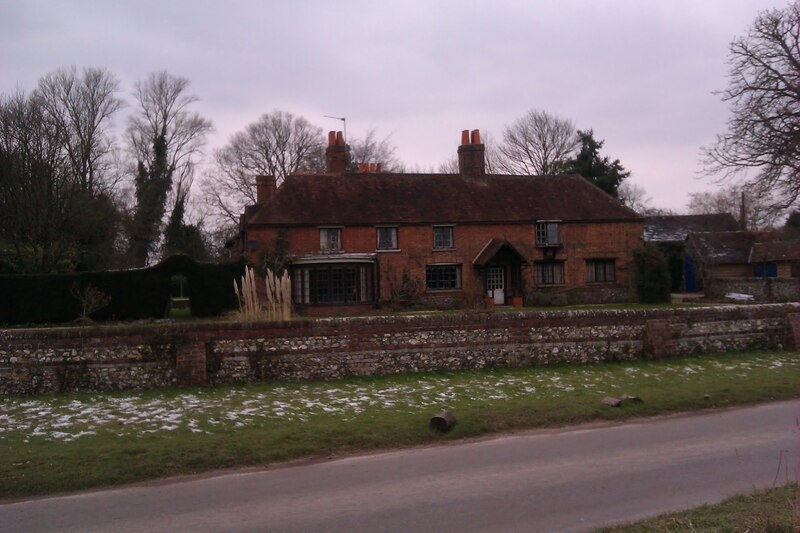 Does anyone recognize this house? Sorry for the dismal image. At least I now know where it is. At the end of the 2006 summer architectural tour, I traveled to Ljubljana, capital of Slovenia, the Balkan state where I would least likely get shot. It was a pilgrimage, not “of sorts” but a real pilgrimage to see the works of Jože Plečnik, the 20th century’s counterpart to Michelangelo’s Mannerism. 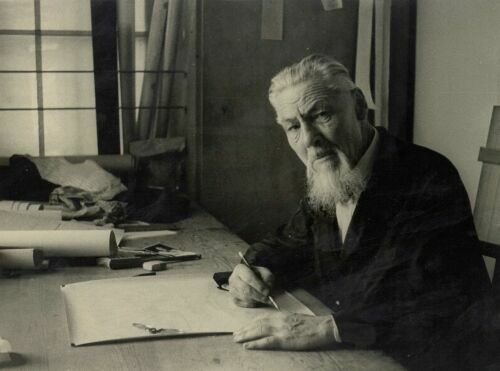 I am awed by Plečnik’s work and consistently place him in my Top Ten. There’s little chance that he’ll be supplanted by another. A Slovenian by birth, Plečnik studied architecture in Vienna and came under the influence of Otto Wagner and the Viennese Sezession. At the end of WWI, he was invited by Jan Masaryk, first president of the new nation of Czechoslovakia, to become the architect of Czech nationalism and aid in the conversion/adaptation of Prague Castle as the seat of the new government. Plečnik’s “interventions” there are poetic explorations of architecture’s power to engage the viewer, especially through the sense of touch. Eventually he returned to his homeland and became the de facto city architect of Ljubljana. That city is rich with his late art, architecture and urbanisms, such as the “Triple Bridge” and river revetments at the city center. I could have met him, being twelve years old when he died in 1957. What was I thinking? My friend Crazy Richard needs to see this stuff, too. Saturated—but ready to go again for another immersion in one of the finest architects that the 20th century had to offer—I boarded a train for the return trip across the Karst, the windswept plain stretching between Ljubljana and Trieste. It was a sleepy afternoon ride, and as I dozed the Slovenian countryside inched slowly by, small towns and villages along the rail line. In one of those unremarkable, subliminal hazes, the passing of vernacular forms inspired some harmless doodling. Very soon, before we even reached the border and customs control, I’d sketched a home that might have fit that scruffy Slavic landscape. The idea stuck and got refined on the rest of the journey home. I think it’s not a bad house, though one more atuned to a hot semi-arid site. But I also wonder now, seven years later, whether it could be adapted to Agincourt and vicinity. Dr Bob warned me about moving there, so this is just fiction. Really. 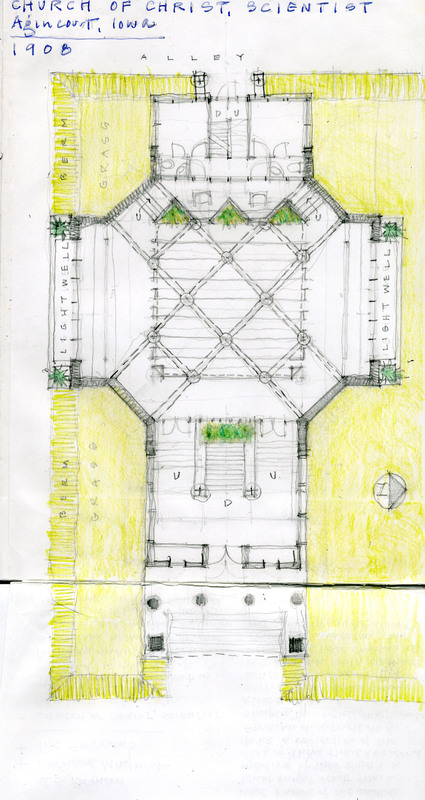 The idea was connected pavilions, good enough I suppose and influenced more by Lou Kahn than Plečnik. But the twist I’ve enjoyed is eliminating the names of rooms—nouns—in favor of verbs: defining and delineating spaces by the things we do in them. Or is it what they do for us? It seems to me a better way to think about domesticity. 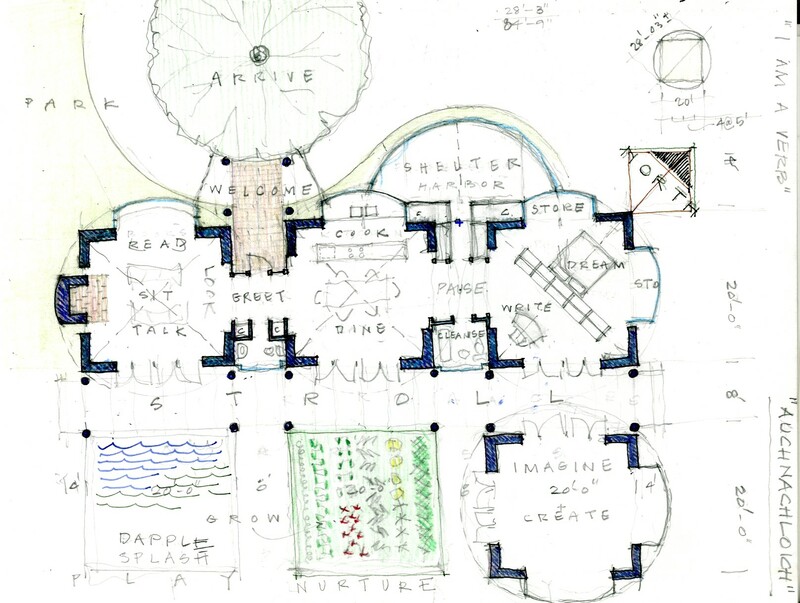 Oh, by the way, I feel somewhat vindicated by a new book on the houses of Lou Kahn. You should buy it and learn about Kahn through a series of under-reported and under-appreciated single-family homes he designed throughout his career. As long as I seem to be on a Byzantine jag, here’s a pop quiz for you. 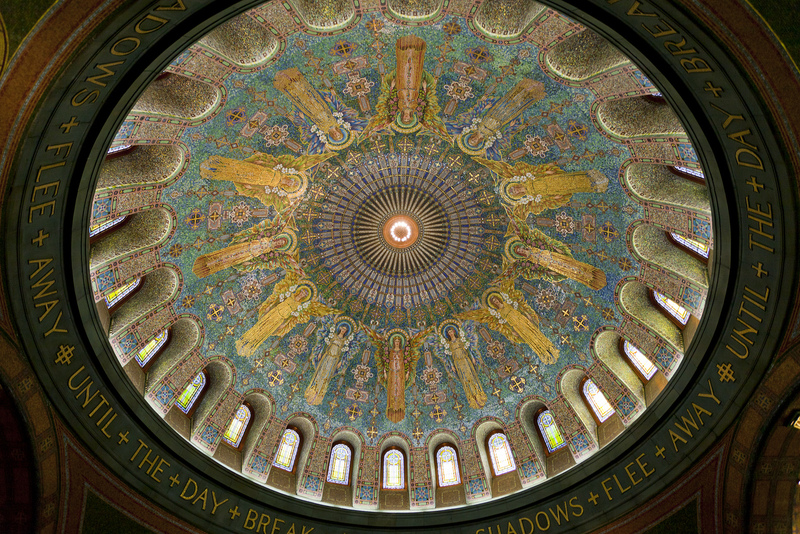 Anyone care to speculate about the church interior shown above? 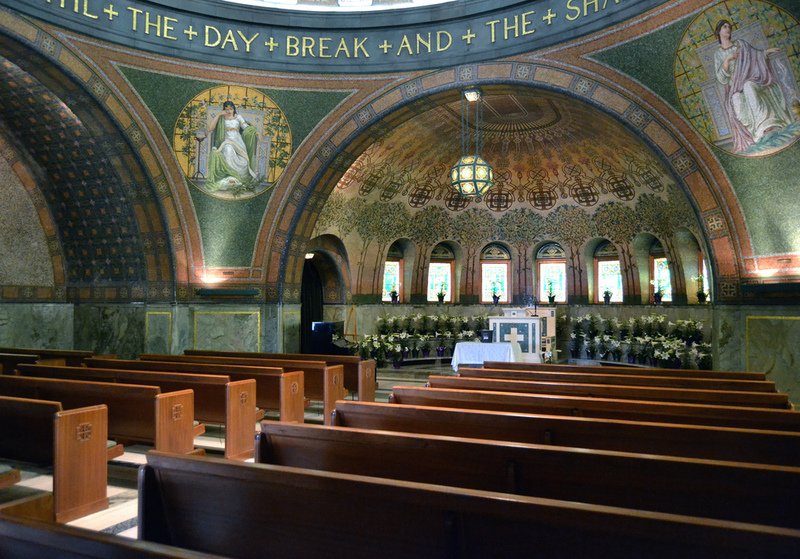 For the Byzantophilics out there—and I count myself among you—the finest regional example is Lakewood Cemetery Chapel in Minneapolis at the bottom of Hennepin Avenue. Just drive south; you can’t miss it. 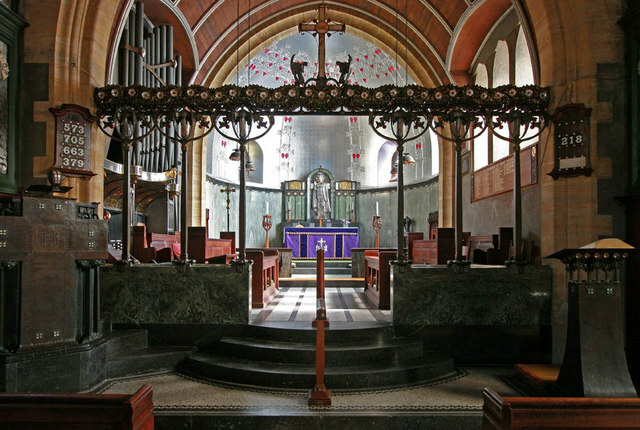 The end of your journey will be the most widely known work of architect Harry Wild Jones (1859-1935). He was also the architect of a former Baptist church in Detroit Lakes (long ago demolished) and three buildings in North Dakota (all still standing, at least temporarily). Byzantine architecture is the very soul of modularity. Since that would also be me, then I should find a way to channel the design sensibilities of Anthemius of Thrales and Isodorus of Miletos, two of my favorite guys and all around great architects worthy of our respect. But where might such a luxurious lump of masonry occur in Agincourt. The cemetery remains a largely unexplored resource. Perhaps I should drive out there for an inspection tour tonight. When John Farrow wrote “Mass at Westminster”, he meant the cathedral, not the abbey. for at the other end of Victoria Street in London is a treat sought out by few. Sure, you can endure the hordes at Westminster Abbey, pay their outrageous fee for a photo permit, and then be herded through at breakneck speed. Been there. Done that. Didn’t enjoy it one bit. 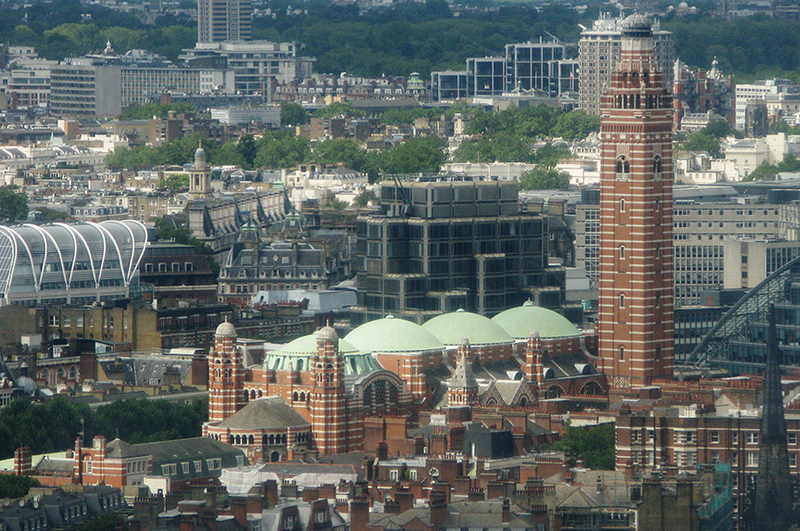 Or you can stroll westward toward Victoria Station and bear left just before the depot. 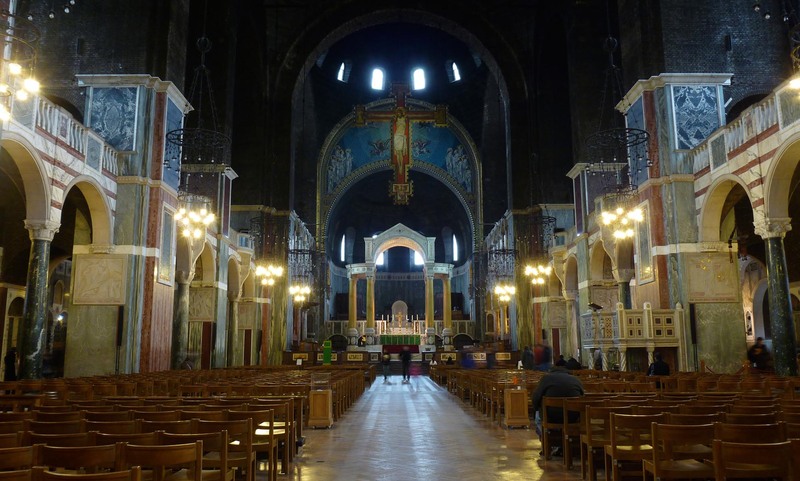 For there you will find Westminster Cathedral, which is, I am certain, the church implied by Farrow’s poem. Here are tall windows pouring in “their tinted beauty / To be lost again in shadow.” Reading Farrow’s poem, I recalled the cathedral’s “dark splendor” and heard again “the warming tinkles” announcing Transubstantiation and could nearly smell the “fleeting trace” of incensers (thuribles) swung by boys of fourteen. This was a 5:00 p.m. weekday service, yet there was a boy choir, the youngest of whom might have been no more than eight years old. The architect for Westminster was John Francis Bentley (1839-1902) who chose with and for his client a building in the Byzantine style a la St Mark’s in Venice and Hagia Sophia in Istanbul. He saw the former, by the way, but missed the latter on a preparatory study tour. Sadly, the budget could keep pace with the aspirations of neither client nor architect and so the building’s elaborate decorative scheme of marble veneers and mosaics had to be abandoned. It lavishes the walls to about twenty feet and adorns most of the chapels, leaving the multi-domed nave in red brick Victorian gloom. Like all great spaces, however, Westminster succeeds through its multi-sensory approach to the worshiper. Looking at these images, what I recall was the sound and smell of the service, as well as its stirring imagery. So, when next you are in London, try the other end of Victoria Street and avoid the crowds. Seven Poems in Pattern is a slim volume by John Farrow published in 1955 by the Rampant Lions Press. I got a very good price on it from a book dealer in Bloomington, Illinois; who knew there were book dealers in Bloomington, Illinois. It arrived this morning and I immediately sat down to enjoy both the book and its contents. Will Carter founded the press in 1936 and it still issues occasional titles, though managed now by the founder’s son Sebastian. This is the second Rampant Lions title that I’ve acquired. To be lost again in shadow. The priest moves in dark splendor. High, and to Him who is already there. Three things about the poem and its author: 1) John Villiers Farrow had seven children, among whom there is one Mia; 2) Farrow’s son John Charles, one of Mia’s three brothers, has recently been imprisoned for child abuse for a period of ten years; and, finally 3) I am haunted by a line from the poem itself which I shall have to ponder at greater length. A little architectural splicing in the genetic lab of the future and this is what you might get: Formulaic S.S. Beman enlivened by the wicked Arts & Crafts tomfoolery of Bernard Maybeck. I’d invent time travel to have a beer with Bernie. Beman, not so much. I think this effort might require an architectural model. Sometimes it’s hard to keep the story straight, like the several construction dates thrown about so casually. I’d better pick one—1908—and stick to it. PS: According to the note at the bottom of the plan, I drew this on the plane returning from Cairo with my friend Crazy Richard. Has it been that long already?